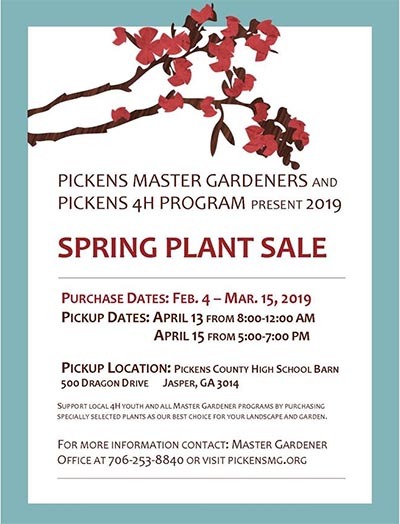 Description: UGA Extension Office Pickens County GA 4-H / Master Gardener Spring Plant Sale runs from February 4th through March 15th, 2019. By purchasing plants from the 2019 4-H Spring Plant Sale, you will help fund our 4H programs. Your support enables our youth to compete at both local and state levels in a variety of subjects, as well as attend summer camps and participate in community service projects. It also allows the Pickens County Master Gardeners to continue supporting many local charitable organizations (including Habitat for Humanity, ACES and Good Samaritan) in a variety of planting and landscaping projects, to sponsor workshops, and to provide programs at the Saturday Farmers Market. Additionally, Master Gardener members help man the office for the Extension Agency. Pick-up dates for orders are Saturday, April 13th, from 8:00 to noon, and on Monday, April 15th from 5 p.m. to 7 p.m. at the Pickens High School Barn. Tickets/Signup: Reserve for purchase by mailing the order form to the Extension office at 502 Stegall Drive, Jasper, GA 30143, or by bringing it to our office no later than Friday, March 15, 2019.